Topic: UK life expectancy, since the Tories got in. 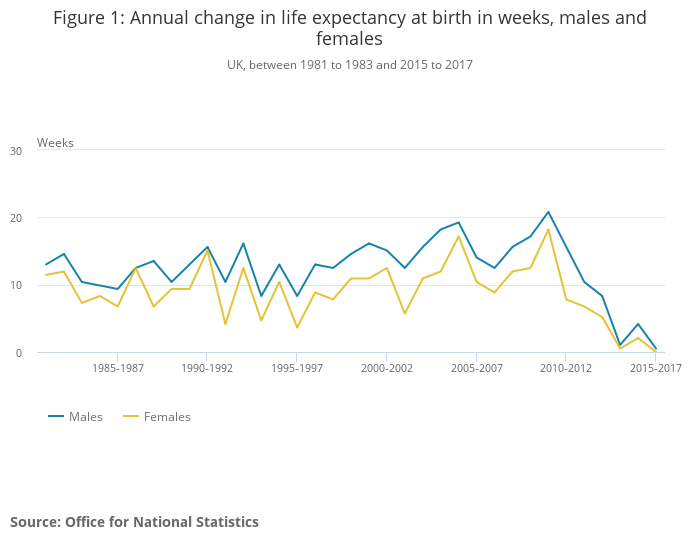 Re: UK life expectancy, since the Tories got in. That makes it look like every baby dies at birth. Or it's statistics doing what it does best. I have no idea what that graph means. Indeed. But, with the Tories cutting their funding, to fund corporation tax reductions, they have to prioritise and you can't please everyone. Or, indeed, anyone. Cut stuff for us, to give the rich fukkers more. They promised not to increase Income Tax, and to increase Personal Tax thresholds. So they just increased other taxes, by cutting money to councils who then cut services and increased local taxes including Business Rates and Poll Tax. Two weeks to the early Budget though, and I think we're all going to be stuffed again.